Adding some Halloween flavor to your shower is easy when you use Halloween-inspired baby favor ideas. Here are some baby favor ideas that will subtly enhance your shower around Halloween time. 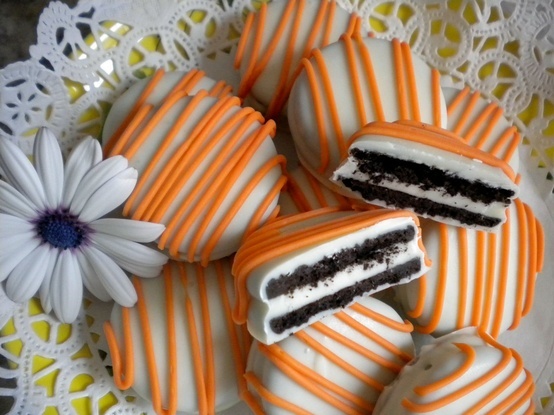 Using baby favor ideas with a touch of Halloween flavor is an easy way to celebrate the holiday, and it’s a great way to add a little fun into the mix. Using Halloween-inspired baby favor ideas to add some Halloween spirit doesn’t mean you have to deck out your shower in black and orange colors or ask your guests to wear costumes to the occasion! You can still use baby favor ideas with a touch of Halloween flavor to subtly enhance your existing shower decor without going too overboard. Personalized Halloween Candy Goody Bags—Try personalizing favor bags or boxes, like the “Design Your Own” Favor Boxes (which do come in black if you prefer to use a Halloween-inspired color) and fill them with your favorite Halloween candy. 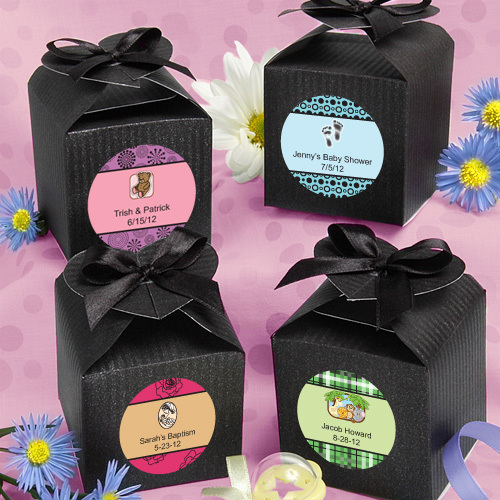 You can personalize the bags or boxes with the baby’s name, your due date, or the date of the shower. This is an easy way to add some Halloween flair to your shower without taking away from the classic feel of a baby shower. 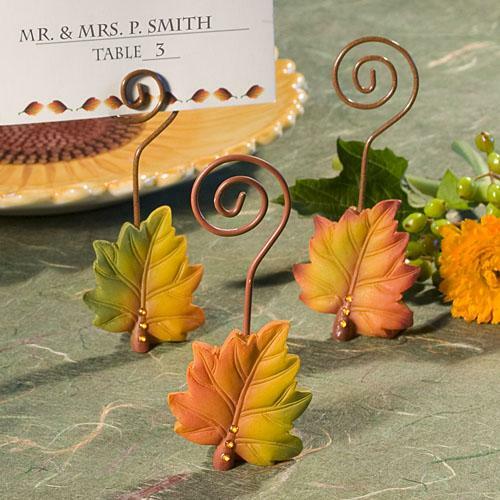 Spooky Place Card Holders—Use fall-inspired place card holders, such as the Leaf Design Place Card Holders to display spooky place card designs with your baby’s name or due date on the front. You can also display artistic baby photos with Halloween themes for extra decoration, such as Anne Geddes baby prints. We love this baby favor idea! 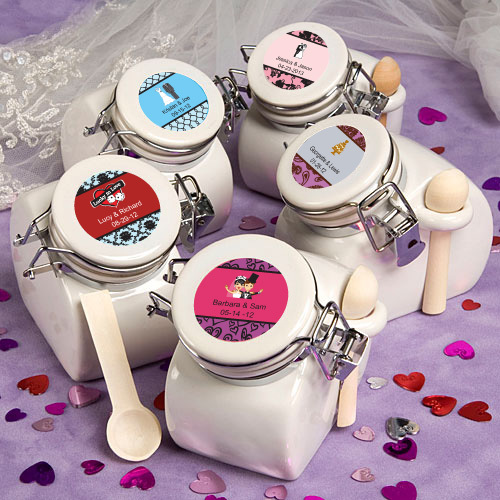 Personalized Spook Jars—Create your own fun concoctions of fright without sacrificing the pretty, classic look of baby favors by using the Personalized Expressions Collection Ceramic Jars Favors. Fill them up with creep crawly sweet treats like gummy worms or black spider-shaped liquorices. On the outside, these jars look sweet and innocent, but when your shower guests open them, they’ll get a Halloween surprise. You can customize the lids of the jars with any text or message you’d like, making these baby favor ideas fit for any shower in need of some Halloween flavor. This entry was posted in Baby Favor Jars, Holiday Baby Favors, Place Card Holders and tagged black, halloween baby favors, orange. Bookmark the permalink.